Matt Danmor thinks he is lucky. Not many people survive a near death accident with nothing more than a bout of amnesia, a touch of clumsiness and the conviction that the technician who did the MRI had grey skin and hooves. Still, it takes time to recover from trauma like that, especially when the girl who was in the accident with you disappears into thin air. Especially when the shrinks keep telling you she is just a figment of your imagination. So when the girl turns up months later looking ravishing, and wanting to carry on where they left off, Matt's troubled life starts looking up. But he hasn't bargained for the baggage that comes with Silvy, like the fact she isn't really an English language student, or even a girl. Underneath her traffic stopping exterior is something else altogether, something involving raving fanatics bent on human sacrifice, dimensionally challenged baked bean tins, a vulture with a penchant for profanity, and a security agent for the Dept of Fimmigration (that is Fae immigration for those of you not in the know) called Kylah with the most amazing gold-flecked eyes. 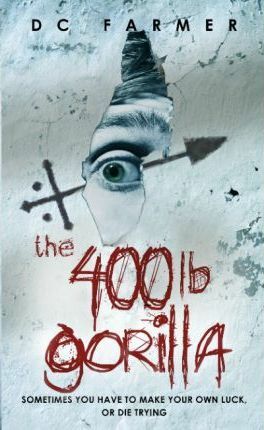 The `400lb Gorilla` is a caustic, (vampire-free) introduction to the Hipposync Archives: Contemporary fantasy at its sparkling best. DC Farmer began writing psycho-thrillers while his children slept. They grew up--and so did he. Now he writes contemporary urban fantasy under the umbrella of the Hipposync Archives. When he's not stringing sentences together he still practices medicine; a career which, over the years, has taken him to London, Oxford and Bristol. In 1986, he dropped anchor in West Wales where he now lives with his wife and two dogs, in the shadow of the Black Mountains, making things up as he goes along.